Right so it will be this then. Thanks MM. That looks good for me, although tall, slim folks will surely disagree (and I would agree with them). We are much closer now to a vintage "cowboy jacket" fit, but the only real way to address the length issue is to either produce "regular" and "long" versions, or to allow folks to specify their individual preferences. But then, I guess we would be getting close to MTM, which would surely increase the price. We seem to be missing a size 42 - surely a pretty popular size. Pit-to-pit would be 23" and an 18.5" shoulder. 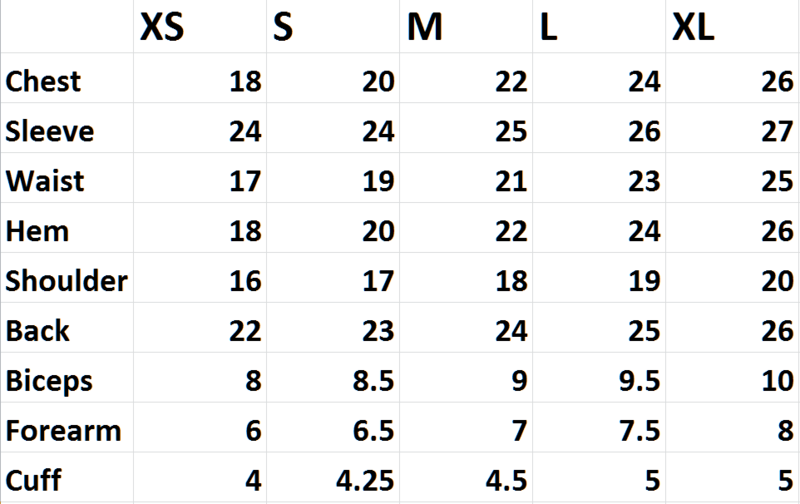 Here, FWIW, is my take on the sizes. First, I would lose the size XS, which is effectively a size 32 - not even an adult's size. I would also be tempted to lose the XL, which, at size 48, is a minority need. 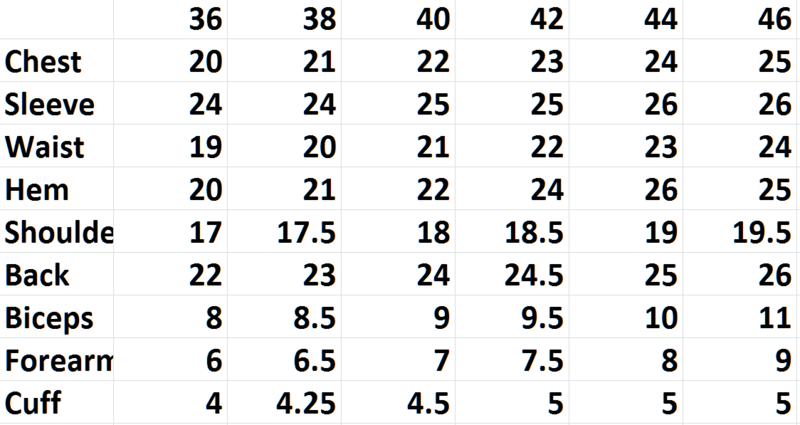 I would then add in the sizes we are missing - i.e., the 38, the 42 and the 46, all popular sizes that we are currently not addressing. 36. pit-to-pit: 20". Shoulder: 17"
38. pit-to-pit: 21". Shoulder: 17.5"
40. pit-to-pit: 22". Shoulder: 18"
42. pit-to-pit: 23". Shoulder: 18.5"
44. pit-to-pit: 24". Shoulder: 19"
46. pit-to-pit: 25", Shoulder: 19.5"
Lengthwise, I would offer two lengths across the range. Regular at 24", and Long at 26", with corresponding sleeve length. Re all the other measurements, the main ones, for me would be height of armhole and width of sleeve. Vintage equals high arm holes and slim sleeves. These both got wider from the mid 60's onwards. That's great MM thanks! What do you think? That's perfect for me, Simon. As has been discussed previously, the taller, yet thin folks amongst us are gonna want longer lengths on skinny jackets. But I guess the regular/long thing is too expensive an option. As I say, spot on for me, and covering all popular sizes now. Thanks MM, I mean that. (05-14-2015, 09:03 PM)SJC Wrote: Thanks MM, I mean that. You are too kind, Simon. Is the hem size on the 44 and 46 switched? Just a quick note on shrinkage. And this applies to ALL the denim stuff, not just the jackets. The stuff Simon is using is Sanforised, and as such, in theory, will NOT shrink. However, my experience of Sanforised denim, particularly Jap stuff, is that it WILL have some shrinkage. A cold soak (which any denim should have) could cause a little, and washing at any temperature other than cold will almost certainly cause some. Now the nature of the stuff is that it will then stretch back to its original size with wear, but bear in mind it will only stretch back where it is stretched - i.e subjected to stress. Which means waistbands on jeans, say, will stretch (because your gut is pushing at it), but lengths of garments, and sleeves, legs, etc., (which get no stress) will remain at their shrunken size. So maybe best to bear that in mind if a sizing is close to the max you require. I could of course be wrong - maybe Simon has done some washing tests, and I might be talking complete bollox. Correct, see above, thanks MM. (07-02-2015, 09:13 PM)SJC Wrote: Correct, see above, thanks MM. I'm looking "above", but I'm seeing no reference to shrinkage. "What he said", is probably what I should have said. "Above" as in previous post, just my luck it went over the page, ha!